Sometimes an opportunity presents itself that is just perfect for everyone involved. My sister (aunt of the men-children) is just undertaking a major landscaping project at her home. It’s the works – complete gutting of the backyard, removal of all trees, plants, out-buildings, concrete slabs (literally back to dirt), and then starting again, with a new shed/studio, trees, paths, lawn, vegie patch etc. As she contemplated the enormity of the job they had undertaken recently, which like all good couples they are largely doing themselves (occasionally “assisted” by a 3-year-old of course), it occurred to me that I had two potential workers to offer her. Who better to employ than the men-children? Both currently unemployed as you know, just at the end of their AFL and Rugby seasons, and pre rowing season, with spare weekends and a desire for cash. Perfect! The upside for my sister – the cheapest labour you can get (at $10/hour plus meat pies and Coke), and non-union to boot! So off they went last weekend for their first shift of labouring. Dressed just like a couple of “tradies”, raring to go. Now if the truth be known I am not sure what my sister and brother-in-law expected, although I suspect they thought they might be a bit soft, and/or slack (in keeping with the “private school boy” image). The reality was something quite different. They both jumped straight into the work, and achieved a huge amount over a six-hour period. It has to be said, which 16-year-old boy wouldn’t enjoy belting the crap out of an old timber floor, wielding an axe, chopping down trees etc. They did a good enough job to be invited back this weekend. 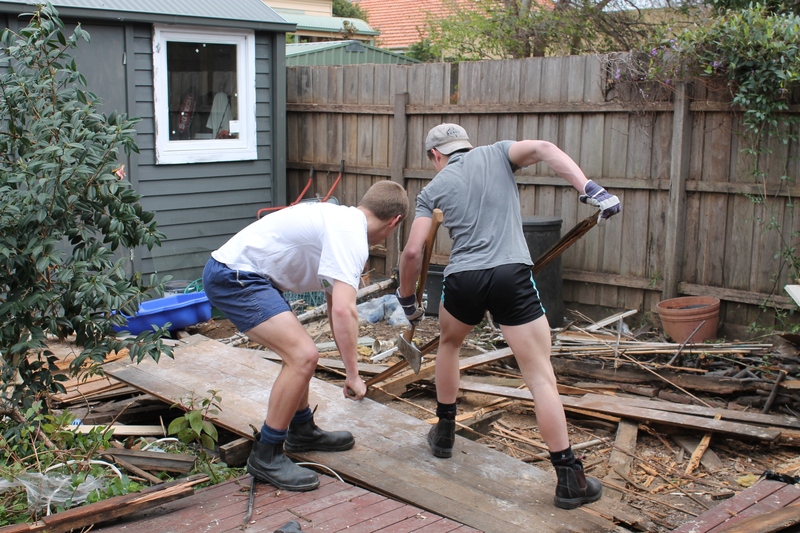 They were even complimented on their work ethic, and one on his very practical approach on the day, the latter for the aspiring “tradie” who is keen to leave school to pursue a career in building. I was quietly chuffed to hear this. So home they came, with their earnings, dirty and sweaty but satisfied. They were thrilled to have the money to spend that night (I think “Dan” was the recipient of some of it), we were thrilled not to have to fund their social life for a change, and my sister and brother-in-law were thrilled to have broken the back of the clean up stage. A veritable trifecta of happiness. This project should see them out to the end of the school holidays, and then we’re back into sporting commitments. I have already offered their services to another friend who is building a new house, and of course will have a large DIY landscaping job at the end of it. Enquiries for future work welcome, but if I get them too many gigs I will have to look at taking a commission!! I have written about each of their previous employment “opportunities”: Pyramid Selling and Burger Joint.